Soak and cover orange zest and the rest of the dried fruit in Cointreau and fresh orange juice and refrigerate overnight. Cream butter and sugar until light and fluffy. Add eggs one at a time beating well in between. Using a separate bowl, sift flour and baking powder and fold gently into the wet ingredients. Lastly, fold in fruit and the juice that it was marinated in to just combine. 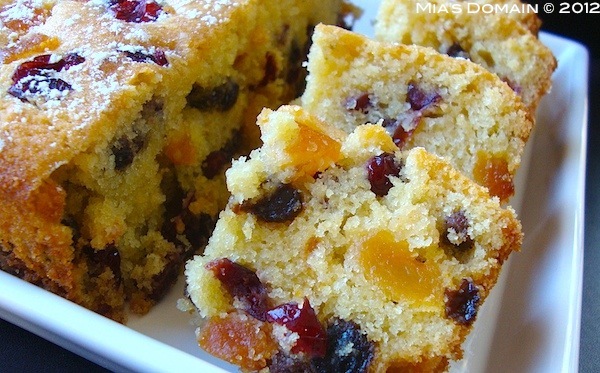 Pour into a prepared square cake pan (8 by 8" or 20 by 20 cm). Bake for 2 hours or until a stick inserted into the middle of the cake comes out clean. Remove from the oven and let the cake cool completely before removing from the pan. Labels: Apricot, baking, butter cake, cointreau, fruit cake, orange zest, pomegranate, raisins, tea cakes. This looks so good. I am such a bread fiend! Perfect for the upcoming holidays! Thanks for sharing at Church Supper. Have a blessed week.